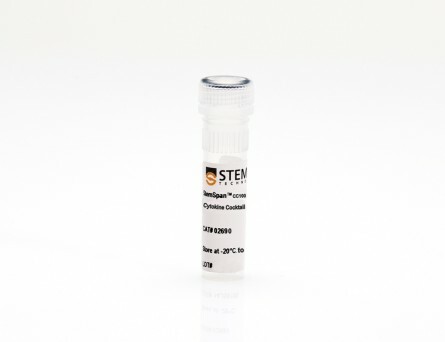 StemSpan™ CC110 (100X) contains a combination of early-acting recombinant human cytokines (Flt3L, SCF and TPO) formulated to support the proliferation of human hematopoietic cells. 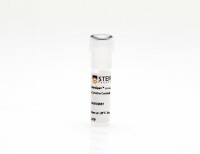 CC110 is intended for use in combination with StemSpan™ SFEM, SFEM II, H3000 or -ACF serum-free expansion media. 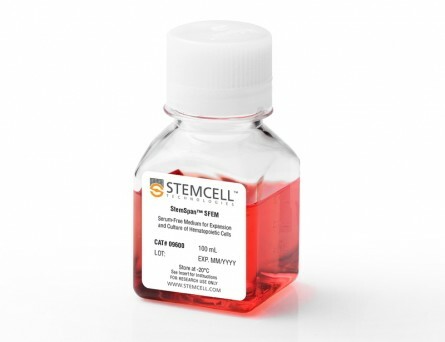 When added to serum-free medium, CC110 promotes the expansion of CD34+ cells isolated from human cord blood and bone marrow. 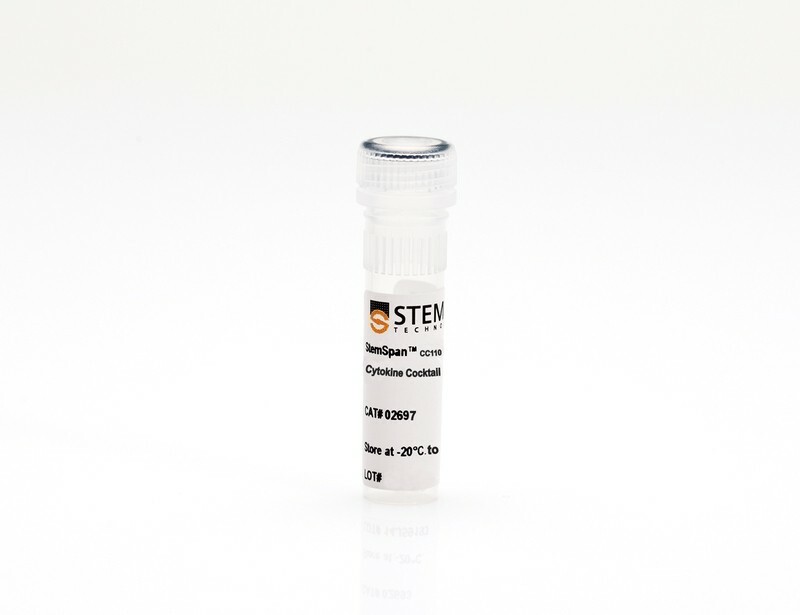 CC110 stimulates similar expansion of CD34+ cells as CC100, but with higher purity and is meant for use in short-term cultures to activate stem cell and immature progenitor cell cycling, without necessarily promoting the proliferation and differentiation of later progenitors. 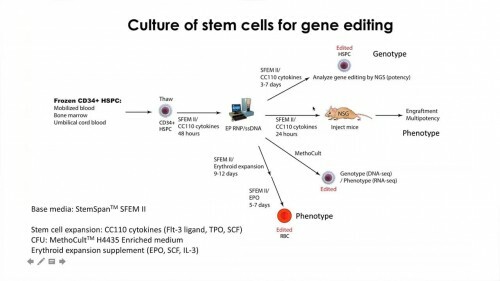 Selection-free genome editing of the sickle mutation in human adult hematopoietic stem/progenitor cells. M. A. DeWitt et al. 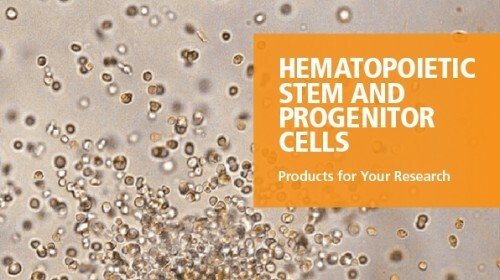 Genetic diseases of blood cells are prime candidates for treatment through ex vivo gene editing of CD34+ hematopoietic stem/progenitor cells (HSPCs), and a variety of technologies have been proposed to treat these disorders. Sickle cell disease (SCD) is a recessive genetic disorder caused by a single-nucleotide polymorphism in the $\beta$-globin gene (HBB). Sickle hemoglobin damages erythrocytes, causing vasoocclusion, severe pain, progressive organ damage, and premature death. We optimize design and delivery parameters of a ribonucleoprotein (RNP) complex comprising Cas9 protein and unmodified single guide RNA, together with a single-stranded DNA oligonucleotide donor (ssODN), to enable efficient replacement of the SCD mutation in human HSPCs. Corrected HSPCs from SCD patients produced less sickle hemoglobin RNA and protein and correspondingly increased wild-type hemoglobin when differentiated into erythroblasts. When engrafted into immunocompromised mice, ex vivo treated human HSPCs maintain SCD gene edits throughout 16 weeks at a level likely to have clinical benefit. 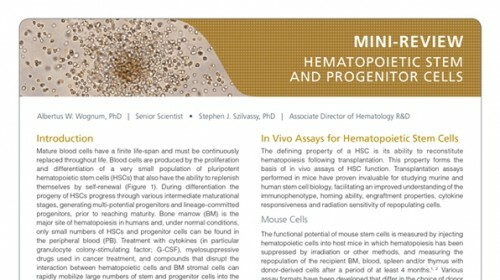 These results demonstrate that an accessible approach combining Cas9 RNP with an ssODN can mediate efficient HSPC genome editing, enables investigator-led exploration of gene editing reagents in primary hematopoietic stem cells, and suggests a path toward the development of new gene editing treatments for SCD and other hematopoietic diseases. Directed evolution of a recombinase that excises the provirus of most HIV-1 primary isolates with high specificity. Current combination antiretroviral therapies (cART) efficiently suppress HIV-1 reproduction in humans, but the virus persists as integrated proviral reservoirs in small numbers of cells. To generate an antiviral agent capable of eradicating the provirus from infected cells, we employed 145 cycles of substrate-linked directed evolution to evolve a recombinase (Brec1) that site-specifically recognizes a 34-bp sequence present in the long terminal repeats (LTRs) of the majority of the clinically relevant HIV-1 strains and subtypes. 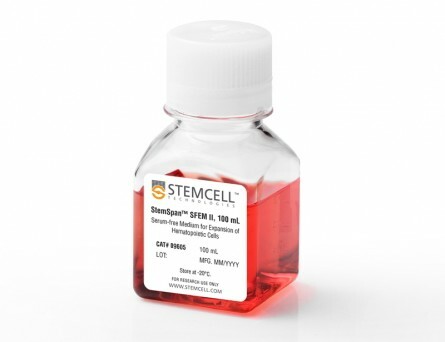 Brec1 efficiently, precisely and safely removes the integrated provirus from infected cells and is efficacious on clinical HIV-1 isolates in vitro and in vivo, including in mice humanized with patient-derived cells. Our data suggest that Brec1 has potential for clinical application as a curative HIV-1 therapy. PPAR-α and glucocorticoid receptor synergize to promote erythroid progenitor self-renewal. 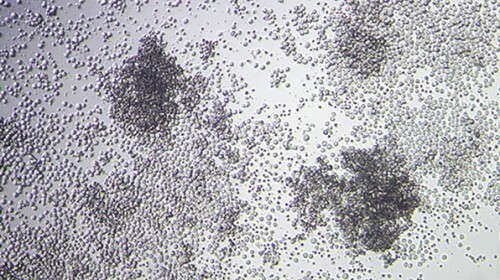 Many acute and chronic anaemias, including haemolysis, sepsis and genetic bone marrow failure diseases such as Diamond-Blackfan anaemia, are not treatable with erythropoietin (Epo), because the colony-forming unit erythroid progenitors (CFU-Es) that respond to Epo are either too few in number or are not sensitive enough to Epo to maintain sufficient red blood cell production. Treatment of these anaemias requires a drug that acts at an earlier stage of red cell formation and enhances the formation of Epo-sensitive CFU-E progenitors. Recently, we showed that glucocorticoids specifically stimulate self-renewal of an early erythroid progenitor, burst-forming unit erythroid (BFU-E), and increase the production of terminally differentiated erythroid cells. Here we show that activation of the peroxisome proliferator-activated receptor α (PPAR-α) by the PPAR-α agonists GW7647 and fenofibrate synergizes with the glucocorticoid receptor (GR) to promote BFU-E self-renewal. Over time these agonists greatly increase production of mature red blood cells in cultures of both mouse fetal liver BFU-Es and mobilized human adult CD34(+) peripheral blood progenitors, with a new and effective culture system being used for the human cells that generates normal enucleated reticulocytes. Although Ppara(-/-) mice show no haematological difference from wild-type mice in both normal and phenylhydrazine (PHZ)-induced stress erythropoiesis, PPAR-α agonists facilitate recovery of wild-type but not Ppara(-/-) mice from PHZ-induced acute haemolytic anaemia. We also show that PPAR-α alleviates anaemia in a mouse model of chronic anaemia. Finally, both in control and corticosteroid-treated BFU-E cells, PPAR-α co-occupies many chromatin sites with GR; when activated by PPAR-α agonists, additional PPAR-α is recruited to GR-adjacent sites and presumably facilitates GR-dependent BFU-E self-renewal. Our discovery of the role of PPAR-α agonists in stimulating self-renewal of early erythroid progenitor cells suggests that the clinically tested PPAR-α agonists we used may improve the efficacy of corticosteroids in treating Epo-resistant anaemias. Mutant nucleophosmin deregulates cell death and myeloid differentiation through excessive caspase-6 and -8 inhibition. In up to one-third of patients with acute myeloid leukemia, a C-terminal frame-shift mutation results in abnormal and abundant cytoplasmic accumulation of the usually nucleoli-bound protein nucleophosmin (NPM), and this is thought to function in cancer pathogenesis. Here, we demonstrate a gain-of-function role for cytoplasmic NPM in the inhibition of caspase signaling. The NPM mutant specifically inhibits the activities of the cell-death proteases, caspase-6 and -8, through direct interaction with their cleaved, active forms, but not the immature procaspases. The cytoplasmic NPM mutant not only affords protection from death ligand-induced cell death but also suppresses caspase-6/-8-mediated myeloid differentiation. Our data hence provide a potential explanation for the myeloid-specific involvement of cytoplasmic NPM in the leukemogenesis of a large subset of acute myeloid leukemia. In vitro expanded cells contributing to rapid severe combined immunodeficient repopulation activity are CD34+38-33+90+45RA-. 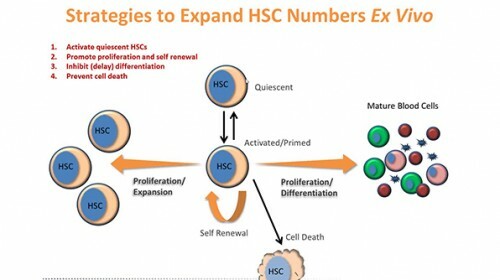 Expansion of hematopoietic stem cells could be used clinically to shorten the prolonged aplastic phase after umbilical cord blood (UCB) transplantation. 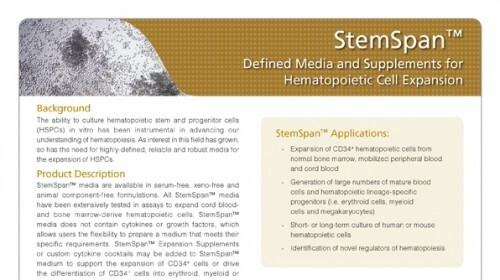 In this report, we investigated rapid severe combined immunodeficient (SCID) repopulating activity (rSRA) 2 weeks after transplantation of CD34(+) UCB cells cultured with serum on MS5 stromal cells and in serum- and stroma-free cultures. Various subpopulations obtained after culture were studied for rSRA. CD34(+) expansion cultures resulted in vast expansion of CD45(+) and CD34(+) cells. 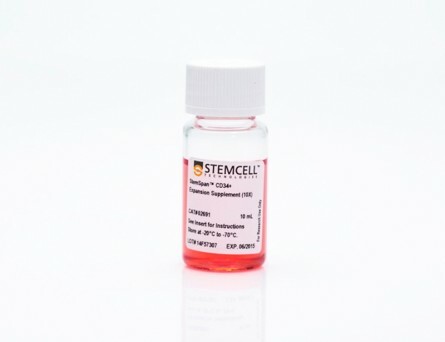 Independent of the culture method, only the CD34(+)33(+)38(-) fraction of the cultured cells contained rSRA. Subsequently, we subfractionated the CD34(+)38(-) fraction using stem cell markers CD45RA and CD90. In vitro differentiation cultures showed CD34(+) expansion in both CD45RA(-) and CD90(+) cultures, whereas little increase in CD34(+) cells was observed in both CD45RA(+) and CD90(-) cultures. By four-color flow cytometry, we could demonstrate that CD34(+)38(-)45RA(-) and CD34(+)38(-)90(+) cell populations were largely overlapping. Both populations were able to reconstitute SCID/nonobese diabetic mice at 2 weeks, indicating that these cells contained rSRA activity. In contrast, CD34(+)38(-)45RA(+) or CD34(+)38(-)90(-) cells contributed only marginally to rSRA. Similar results were obtained when cells were injected intrafemorally, suggesting that the lack of reconstitution was not due to homing defects. In conclusion, we show that after in vitro expansion, rSRA is mediated by CD34(+)38(-)90(+)45RA(-) cells. All other cell fractions have limited reconstitutive potential, mainly because the cells have lost stem cell activity rather than because of homing defects. These findings can be used clinically to assess the rSRA of cultured stem cells.